Austrian police said Friday they were hunting for far-right activists who stormed a Vienna stage during a play performed by refugees and sprayed fake blood on the audience. The protest by the Identitaere movement took place on Thursday evening shortly after the start of “Die Schutzbefohlenen” (“The Suppliants”), whose actors are asylum-seekers from Syria, Iraq and Afghanistan. 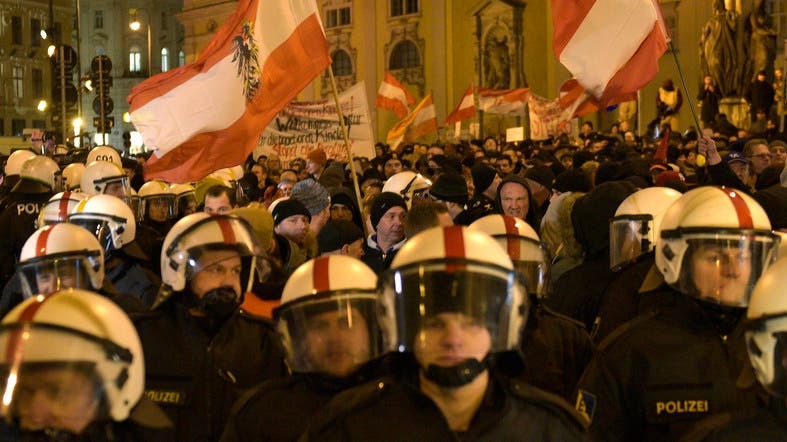 They also threw flyers saying “multiculturalism kills” and fake blood at the 700 spectators inside the lecture theatre at the University of Vienna, police spokesman Thomas Keiblinger told the APA news agency. A short brawl ensued between audience members and the extremists who were eventually pushed out of the auditorium and fled the scene. Eight people have filed charges for bodily harm against the protesters, Keiblinger said. After the upheaval, the play continued to the end under the watchful eye of several police officers, he added. Austrian Culture Minister Josef Ostermayer said the “shocking” incident was the latest in a string of attacks by the Identitaere group. The award-winning play by Austrian Nobel Prize laureate Elfriede Jelinek, first staged in Germany in 2014, is a biting attack on what the author sees as Europe's inhumane treatment of asylum-seekers.